What’s the Right Way to Teach my Child to Floss? What's the Right Way to Teach my Child to Floss? There are many important habits we should teach our kids. One of them is learning good oral hygiene habits when they’re young. Teaching young children the right ways to floss can go a long way in preventing cavities, tooth loss, and other health problems. As parents, we often have many questions regarding flossing: how often should kids floss? When should they start flossing? 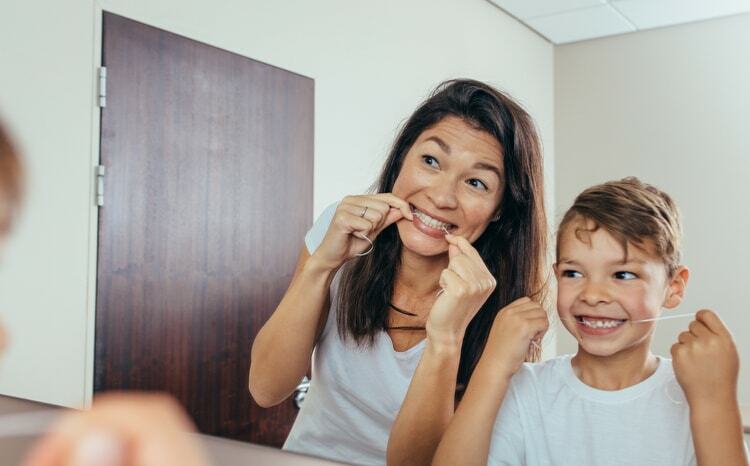 When Should Your Children Start Flossing? Flossing removes plaque, remaining food, and other particles from between the teeth. Your children should start flossing when their tooth surfaces are next to each other. It’s important for children to floss at least once a day. Bacteria, plaque, and food that settles between teeth can cause tooth decay, gum disease, and bad breath. Children should also lightly brush their tongue to remove bacterial plaque.By the age of six, most kids can floss (and brush) on their own, but since they are still young, you may want to monitor how they are handling it. Before that, you’ll need to stand behind your children to guide them on what to do. What Steps Are Involved in Proper Flossing? Hold a short piece of floss between the thumb and index finger. Wrap the ends of the floss around each finger for better control. Take care by applying light (not heavy) pressure when inserting the floss between your child's teeth. Bend the floss into a shape that looks like the letter C, curve it around the tooth, then gently slide it up and down along the side of the tooth and under the gum line. Do this for each place where the tooth surfaces meet. Use a new section of floss for each tooth to avoid putting back food and plaque that is stuck on the floss. Use a small dental brush that’s designed for cleaning between the teeth (interdental brush) to clean between tooth surfaces that have spaces. What Are Some Ways to Make Flossing Fun for Kids? You can make flossing interesting and fun for your children, so they’ll want to do it regularly. Let your child choose the floss. Your child may not like to wind floss around the fingers or find it hard to manipulate string floss. Let your child try child-friendly floss sticks or a water flosser. It’s fun and motivational to do things alongside another, so floss with your children. Add a favorite song or fun story to your flossing sessions. Make a simple flossing chart that will help your children to remember when they’ve flossed. They simply place a checkmark next to the day and time they’ve flossed. Reward your children by placing fun and colorful stickers on their charts, so they can see their accomplishments. Put goals for your children to reach at the bottom of the chart. Set the goals together with your children. Reward the goals you’ve agreed upon as a team each week. Be sure to brush every tooth each time. Hold the brush at a 45 degrees angle to make it easier to reach the gum line. Brush up from the base of the tooth to the top. Short, round strokes should be used on the fronts and backs of teeth. Short, sweeping strokes should be used on the tops of the teeth where chewing takes place. Consistently brush across each tooth. Don’t forget the gently brush the tongue and roof of the mouth with strokes that move from back to front. Along with your children’s dental care, don’t forget to bring your children to their physician for regular physical checkups. Make an appointment today with Park Avenue Medical Professionals in the Upper East Side of NYC. Our multi-specialty group practice provides integrated medical and health care delivered by expert specialists who work together to help each patient.